You are secure shopping from m925.se! Foreign customers must pay with credit card: VISA or Master card. 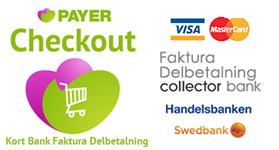 All purchases are connected to Pay&Reads (www.pay-read.se) secure payment server, which means that your credit card information only will be received by Pay&Read or cashing bank. The transfer of information is encrypted with SSL-Secure Socket Layer – 128-bit encryption. M925 will not have access to this card information.